A falling Lake Mead water level may mean rising electric rates for Boulder City residents. The lake’s water level, which is projected to drop to historic lows in the coming years, is slowly affecting the amount of power produced at Hoover Dam. Power is produced as lake water passes through the dam’s 17 turbine generators, on its way down the Colorado River to meet the demands of other water users. The plant’s capacity has already slightly decreased, and there is concern that the water level may drop to the point that the dam could no longer produce hydroelectric power. “At some point they might just have to shut the generators off because they’re vibrating too much and they’re not operating efficiently,” said Jayne Harkins, executive director of the Colorado River Commission of Nevada, the state agency responsible for managing Nevada’s share of dam power. Because the federal government sells Hoover Dam power at cost, it is much cheaper than power purchased on the open market. “The bottom line is to the extent that we lose hydroelectric power due to a drought, we’re going to be trading very cheap hydro power for very expensive power portfolio energy,” said Boulder City Electric Utility Administrator Rory Dwyer. Boulder City is especially vulnerable to cost increases, because Hoover Dam power makes up about 60 percent of the city’s energy portfolio. The increased wholesale energy costs may have to be passed on to the Boulder City ratepayers. “If electric rates go up, the City Council needs to decide how much to pass on to the consumer,” said City Councilman Duncan McCoy. However, in the past, the City Council has been reluctant to raise electric rates. The council was forced to raise rates by 35 percent in 2010, after NV Energy raised its own wholesale rates to the city. The city then severed its agreement with NV Energy, in exchange for a more favorable market power agreement through Silver State Energy Association. But in 2011, a rate study performed by an outside consultant resulted in a recommendation for the city to raise rates, which the council chose not to do. “There’s already a recommendation on the table to raise rates,” Dwyer said. City Manager David Fraser said the city does not have the financial reserves to absorb a wholesale rate increase. It is unknown exactly when Hoover Dam might lose its ability to generate power. 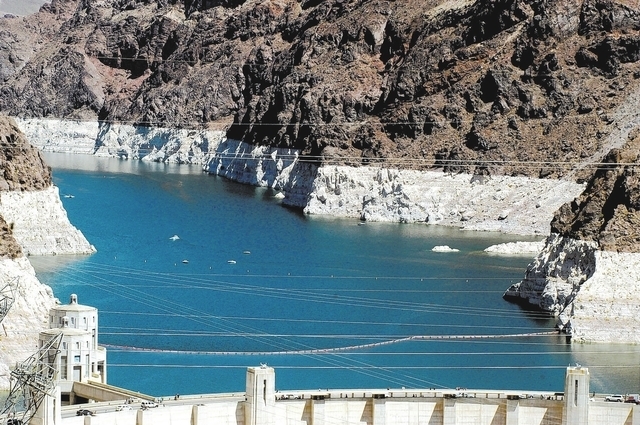 John Entsminger, senior deputy general manager of the Southern Nevada Water Authority, told the City Council Aug. 27 that Hoover Dam would stop producing power at 1,050 feet above sea level. However, according to Skordas, the dam may be able to produce power with a water level as low as 1,000 feet above sea level, but there is “no definitive data” available because the lake has never been that low. According to Harkins, the presumed shut-off level has changed at least once before. “Originally the lake number was 1,083 (feet above seal level); then in the ’80s they rebuilt all the generators. Then they gave us this theoretical level of 1,050 (feet above sea level), which has never been tested,” Harkins said. In order to maximize the available generator output, the bureau is replacing five of the generator turbines over the next couple of years, to help regulate the power production at low water elevations, Skordas said. Another factor is a federal water shortage declaration that will be made once the lake reaches 1,075 feet above sea level, resulting in less water being delivered downstream, and therefore, through the generators. Lake Mead’s current water level is about 1,105 feet above sea level. The bureau currently projects it to drop to 1,075 feet above sea level by Spring 2015. Dwyer said he is working to determine exactly how the decreasing lake level, shortage declaration, and generator shut-off could affect Boulder City. He plans to present this information to the City Council in the coming weeks. Reporter Jack Johnson can be reached at jjohnson@bouldercityreview.com or 702-586-9523.